5/26/11 - The Smokin' Sweater Full Zip from 782 Gear is a modern take on the classic M-65 Field Jacket liner. It's specifically designed as a jacket liner, and not as a stand-alone jacket. Description - The Smokin' Sweater Full Zip is a jacket liner, reminiscent of the classic M-65 field jacket liner. It's not meant to be buttoned or zipped into any particular jacket; just worn underneath for added insulation. The Smokin' Sweater is not intended to be worn for extended time as a stand-alone jacket. Worn by itself, it's more for hanging out inside the wire as 'lounge' warmth, hence the 'Smokin'' name. Its intent is to fill the function of the old M-65 field jacket liner but with the added utility of the zipper and high warth-to-weight ratio insulation using both Primaloft Sport and Climashield® Neo. The Smokin' Sweater also comes in a 1/4 zip pullover version. There's also an outerwear version designed as a stand-alone jacket, called the 'Reprieve'. This has 4oz Climashield® APEX insulation (double that of the Smokin' Sweater) and has a Schoeller Nanosphere DWR shell. There are other products in 782 Gear's Smokin' Midlayer line, like a vest, hooded poncho (Kloke) and chaps (pants). Material - Ultra-light 1.1 oz nylon ripstop nylon and 2 oz Climashield® insulation. Reversible - available in Coyote/MultiCam (shown here), and Coyote/Foliage Green. Collar - Low rider crew neck for less bulk under uniforms or other layers. Open underarms - The underarms are open with a large vent to reduced bulk and maximum ventilation where it's needed the most. Hidden chest pocket - There's a zippered chest pocket on the left side (right side on the inside). Shortened wrists - The sleeves are cut short without elastic cuffs to reduce wrist bulk, under outer garments. They will not get in the way of gloves gauntlets. Sizing, fit etc - I'd say that the Smokin' Sweater fits very similar to the M-65 field jacket liner; it's a relaxed fit. It also feels less bulky and somewhat lighter. As mentioned above, the sleeves are short, so when worn alone, expect the wrists to be exposed if you have longer arms. The jacket is cut short so that it does not extend below the bottom hem of an outer shell. General notes and thoughts - The Smokin' Sweater doesn't have the distinctive quilt pattern of the M-65 liner. Instead, it has eight small X-shaped bartacks placed sewn through all layers to keep the major panels of Climashield insulation in place. Since the Climashield insulation is a continuous fliament, as opposed to , it doesn't clump, shift or migrate like other insulation fillings, hence the quilting is not needed. The Climashield pretty springy, and wants to retain its loft after being compressed. I can roll the Smokin' Sweater into a 6" diameter ball, and it's easily stuffed into the crevases in a pack. The nylon ripstop shell fabric is very light weight and breathable, and allows air to pass through with some resistance. It's not designed as a wind-stopping jacket though; you'll want to have a wind-proof outer shell if you're going to use it in cold, blustery weather. I did my usual test of insulated jackets by using the Smokin' Sweater under a mesh motorcycle jacket on early morning commutes in chilly weather. The mesh summer jacket allows air to flow through, and I can see how well the jacket underneath blocks the wind. With the Smokin' Sweater, I could definitely feel some airflow. I switched to a leather motorcycle jacket with no vents, and the Sweater was a lot warmer, keeping all the warmth in. The open underarms are great - I was initially skeptical of the concept, but found that the underarms really tend to be the one place that will overheat first, and that ventilation in that area is needed. I actually wouldn't mind it if they increased the size of the cutout on the arm side. With the arms at my side, I didn't find cold wind to enter in through the arm vents when I wore the Smokin' Sweater by itself. I'd use the Smokin' Sweater for casual use by itself. As I mentioned before, it's not really designed for hard use as a stand-alone jacket. Since it's a liner, it doesn't have any handwarmer pockets, but it's cut short enough so that I can stick my hands in my pants pockets. The short sleeves end before the wrists, so I had no issues closing the velcro tabs on my external jacket. There is also no interference with gloves from added bulk. One thing I would mind having is a small pull tab inside the sleeve which I can grab while putting on a shell over the Smokin' Sweater. As it is right now, I grab the end of the sleeve so it doesn't ride up my arm when donning the outer jacket or shell. If jacket liner is what you're looking for, for use under a hard shell or other jacket, the Smokin' Sweater should work very well to provide an additional measure of warmth. 6/23/12 - One of the newest items from the LEAF (Law Enforcement and Armed Forces) division of Arc'Teryx to be offered in the Urban Wolf colour is the Naga Hoody. The Naga Hoody is a 'kit staple hoody that combines weather and abrasion-resistant sleeves and hood, with an armour-compatible breathable body.' Its unique hood configuration and snug fit sets it apart from other hoodies. I'm making an assumption here, but based on Arc'teryx's trend of naming their LEAF products after mythical creatures (like the Sphinx and Gryphon), the Naga is most likely named after the Sanskrit word referring to the King Cobra, a hooded serpent, in Hinduism and Buddhism. The Naga is designed as a heavyweight base layer or light weight mid layer under armour or gear; providing a warm, breathable friction-free layer. The low profile hood fits under helmets or tucks behind the neck without bulk. It's also a great mid layer under some of Arc'tyerx's shells. Urban Wolf - Arc'teryx's new Urban Wolf series is a much anticipated shade optimized for urban and industrial environments. Traditional dark uniforms stand out against most modern surroundings like concrete, glass, asphalt and rooftops for urban operations. The medium grey tone of Urban Wolf makes one less noticeable in light or shadow, and was developed as a covert tonal shade for law enforcement and special forces, and offers an alternative to the black, green and brown shades common to tactical clothing. Material - Like the Gryphon and Sphinx tops, the Naga has a composite construction, utilizing different materials for the main body and the shoulders/arms. Polartec® Power Stretch® fleece fabric makes up the torso and upper chest. It has a smooth outer face with a fleece inner face. It's stretchy and very comfortable. Polartec® Power Stretch® with Hardface Technology is used for the tops of the shoulders, sleeves and hood. It's differentiated from the non hardface techonology fabric by the grid pattern on it. For that reason, it looks darker than the torso fabric. This is a body-hugging 4-way stretch fabric with two unique surfaces - a soft fleece inner layer for warmth and comfort; and a smooth outer layer that is abrasion and snag/pick resistant. It's also DWR-treated to repel water. This is the same material as used on the side panels of the Atom LT jacket. The Naga is available in Crocodile and Urban Wolf (shown here). Trim fit - The Naga is designed to be close-fitting; to minimize the amount of bulk when worn under armour or an outer shell garment. It is of hip length with a drop back hem (longer in the rear). Stand-up collar - The 2.5" stand-up collar is constructed of a double layer, and is a separate entity from the hood. 1/4 front zip - The 1/4 front zip provides venting under plate and armour. Trim fitting Drop hood - The hood on the Naga is independant of the collar, and is made of the hardface technology fabric. It's low profile and tight fitting, and has no adjustments. Adjustments are made by pulling it forward or back on the head. It lays relatively flat on the upper back when not in use, and is out of the way. Chest pocket with zip - This is located over the upper left chest, and is best used for flat items. Construction - Hybrid technology - combines materials to enhance functionality and performance. Strategically placed seams reduce friction points under armour. Zippers are corded for ease of use and reduced noise. Stretch sleeve cuffs with thumbholes - The cuffs are made of a stretch fabric and fit my wrists nicely. There's also a thumbhole for protection of the hand. Since the cuffs are very low profile; they don't feel like they get in the way when grabbing an object when worn over the hands. I really like that the cuffs are snug. With some other thumbhole cuffs, they're too loose and let in cold wind, even when worn over the hands. Sizing, fit etc - As I've mentioned before; I'm not skinny nor chubby - sort of in the middle/average. On my 'average medium' frame, the Naga is very form fitting. It's not 'compression tight', but there's no room left over for anything but a t-shirt underneath. Even so, I still have to pull the t-shirt sleeves back down into the sleeves of the Naga as they bunch up under my armpits when I put the Naga on. The gusseted underarms are right up in my arm pits; not flapping around or hanging lower. Snug-fitting T-shirts like Zensah are best worn under the Naga, rather than loose fit T-shirts with a lot of extra fabric to bunch up under it. The Naga is definitely not your relaxed-fit, baggy hoody. It's designed to fit close to the body to minimize bulk when worn under armour or gear, and works very well in this role. If your more muscular or heavier, or just want a looser fit, going up a size might be warranted. Bear in mind that the length of the sleeves and torso will also increase with a larger size. General notes and observations - The Naga is probably the most 'fashionable-looking' hoodies I've seen. Unlike most hoodies, it's trim, form fitting and streamlined. Its athletic cut can make you look good, or reveal your flab - it hides little. What's probably most striking is the hood. Rather than forming the collar, as on a regular hoody, the hood is independant. This collar-inside-the-hood arrangement looks very unique and stylish. It's designed for functionality first, of course, but it also happens to look cool (to me). The hood is also quite unique, fitting closely to the head like a wetsuit hood, instead of the normal relaxed, baggy hood. It looks like something out of Tron, instead of the oversized hoods of the Jedi. My wife thinks it looks weird, but doesn't dispute that it works well. The independant collar and hood allow a lot more versatility than the standard hoody arrangement. The problem I've found with most hoodies is that the collar lets in too much cold air. It's never snug enough. The Naga collar is close fitting and comfy around my neck, preventing cold wind from blowing down into the garment. Its double thickness also helps keep the neck warm. The hood, being close-fitting, doesn't allow cold air to blow around inside either. It doesn't have any adjustment per se, but you can pull it forward or back to adjust how it sits above your eyes. It also works great with ballcaps - I was walking around at the beach and the wind was blowing hard; and I was about to lose my cap. I pulled the Naga's hood over my cap and it retained it securely (and kept my ears warm as well). My main complaint with other garments that have thumbhole sleeve cuffs is that the cuff is usually sized larger to fit over the hands and too loose on my wrists, letting cold air up my sleeves and sitting halfway down my hand. Not so with the Naga. The elastic cuff is sized just right so that it doesn't interfere with my hands when worn on the wrist, and not too tight when worn over the hands. Arc'teryx got this right. When I first started using the Naga, my first impression was 'this isn't very warm for a fleece garment'. Standing sedentary in cold weather or walking around the neighbourhood at night with the wind blowing, it didn't keep me warm and cozy like more heavily insulated garments. I'd equate it to a medium-weight sweatshirt. The fleece has no wind-stopping qualities - you can blow right through the fabric with no resistance. I thought to myself "I'm going to freeze in windy weather." But, I also noticed was that I wasn't cold either. I was on the cool side. When I started exerting a little, I began to understand how this garment works. It forgoes the wind resistance properties by making breathability the priority. This prevents overheating when exerting, and the garment from retaining too much heat when it needs to be gotten rid of. By allowing the wind to pass through it, excess heat and sweat is evaporated, but the body is still kept from getting too cold. That same day down at the beach where my cap was saved by the hood - it was extremely blustery, and a little on the chilly side. I felt the wind blowing right through the Naga, and yet I wasn't cold or uncomfortable. I started jogging slowly to work up a bit of a sweat, and warmed up, but didn't get too hot as the airflow through the garment kept cooling me down and evaporating the sweat. Because it's so breathable, the Naga can be used for a wide range of temperatures, depending on the level of activity. It's not a cold weather piece of snivel gear that will keep you warm when sitting still, but intended for active use. As a stand alone garment, it'll work well up to temps in the low 70's (without exertion). When worn under armour, the breathability really becomes useful to reduce stuffiness. You're still going to get warm around the torso under a plate carrier, depending on the temperature and level of exertion. The hardface-technology fabric is pill and snag resistant - desirable when worn around velcro. Where the Naga also shines is as an insulating garment worn under a shell. If you're in chilly, windy weather and want to maximize its insulating properties, wearing a wind-resistant top like the featherweight Wraith Jacket now makes it impervious to the wind, and traps body heat under the shell. The Naga's snug fit makes it a perfect lining garment under shells like the Drac, Sphinx, Alpha, Alpha LT, Gryphon and Wraith jackets for colder, inclement weather. I've illustrated it below worn under a Drac jacket. The Naga is not as compressible as the Atom LT jacket, but it's still not very bulky for a fleece garment. It's already proven to be a very popular garment, whether it's for tactical or casual wear with the active crowd. It certainly has given my Atom LT some competition - I treat the Atom LT as outerwear, but find myself wearing the Naga both inside and outdoors. Around town, the Naga is just the slickest-looking hoody around, due to its design and tailored fit. With it on, you just look and feel...'active'. 12/16/12 - For those that wanted a hoodless version of Triple Aught Design's popular Ranger Hoodie, your wish has been granted. TAD has released the Ranger Jacket which is still one of the most feature-laden fleece jackets available. Hoodies: some like them, some don't. Personally, I like hoodies as the hood is always available when needed; attached to the jacket. I haven't found them to be in the way or cumbersome. But I'm coming from a civilian perspective, and what some LE and military folk pointed out to me was that a hood can adversely affect hearing, head mobility and limit peripheral vision; all of which can be priorities over warmth in particular environments. If they didn't want to use a hood, they didn't want to have it there to add bulk (which is understandable), and if warmth was needed, they'd wear a fleece cap or hat. Another thing that TAD has done more recently is to offer versions of their jackets with and without the loop velcro fields on the shoulders/upper arms for attaching ID or patches. Some users dislike the 'tactical' look that velcro patches impart and the unwanted attention that it may attract. I'm not a fanboy nor hater of the 'tactical look' in general public, but one thing's for sure - if I see someone walking around with a jacket that has any velcro or patches on the shoulders, it immediately draws my attention, because that's what I'm normally tuned into. So, the new Ranger Jacket is also available patched, or non-patched. The Ranger Jacket is available in Black, Loden Green (a new colour), Coyote Brown (instead of M.E. Brown), and U.E. Grey (shown here). Triple Aught Design has offered their clothing in U.E. (Urban Environment) Grey for years, and has advocated grey as a colour suitable for the urban environment. Grey is less noticeable than black at night against buildings and also in general, when black is sometimes too dark and can stand out. In a LE context, traditional dark uniforms stand out against most modern surroundings like concrete, glass, asphalt and rooftops for urban operations. 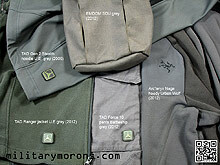 A medium grey tone makes one less noticeable in light or shadow, and offers an alternative to the black, green and brown shades common to tactical clothing. I've really come to like grey as a colour for everyday clothing as well as tactical gear, as it's not so 'military' as OD green or khaki, or as 'ninja' as black. 'Speaking of grey, there are an infinite number of grey shades, with different tints. Trying to get items to match exactly from different manufacturers is going to be quite futile, and really isn't necessary in all practicality. Even matching items from the same manufacturer is difficult if they're made of different materials. TAD's U.E. Grey is usually different for different U.E. Grey garments made of different fabrics. For the sake of comparison, I took the photo below comparing the U.E. Grey Ranger jacket, Battleship Grey NYCO ripstop Force 10 pants, EMDOM SDU Grey Cordura nylon, the Arc'teryx Naga Hoody in Urban Wolf, and Gen 2 Stealth Hoodie in U.E. Grey. Under fluorescent lighting, the fleece of the Ranger jacket takes on a slightly greenish tint when compared to the other fabrics that's not apparent under natural lighting. As you can see from the rest of the photos, it's really hard to nail down a colour in a photo on a computer screen - they all look slightly different. Wiki has a good article on the variations of grey. Material - The Ranger Jacket is made out of the same premium/heavy weight 10 oz Malden Mills/Polartec WindPro 100% polyester fleece fabric as the Ranger Hoodie, with a DWR finish. WindPro is very dense, and 4 times more wind resistant than traditional fleece fabric. It has a very tight, smooth construction to reduce the effects of wind chill, a problem with traditional fleece. The inside surface is pebbled which traps the air for a high warmth-to-weight ratio. It's also highly breathable - maintaining 85% of the breathability of traditional fleece. The smoother outer surface is also pill-resistant and more durable. The fleece is more dense than some other fleeces, resulting in a more 'compact' and less bulky garment than the SPEAR or USMC fleece jackets with better insulation and wind blocking. Note that because it's dense, it's not considered a compressible garment, so you won't be rolling up into a little ball and putting into a pant cargo pocket. WindPro is also surprisingly water resistant as a result of its DWR (Durable Water Repellent) finish, as I found out through previous experience with the Ranger Hoodies in light rain.The fabric does not attract or hold water as much as natural fibers. Raindrops bead on the surface of the fleece and do not penetrate all the way through for quite a while. It's also very wind resistant, and over the past years I've worn my Rangers in some chilly, windy weather and been very impressed with their performance and utility. High, stand-up collar - The collar is 3.5" tall, and seals around the neck quite well without being too tight or restrictive. Some jacket collars are too loose and let cold air in. The zipper has a neck guard for comfort. There's a little molded plastic loop on the inside of the jacket below the collar (at the top corner of the chest pocket) on each side for routing the cables. Colour-matched YKK covert zippers - All zippers and pulls are colour matched to the Hoodie. Instead of the sewn webbing zipper pulls on earlier versions of the Ranger Hoodie, this Ranger Jacket has thin cord pulls, which I don't like as much (more on that later). One-handed bottom hem drawcords - In the bottom hem are elastic waist drawcords on each side, with cord-locks. They're cinched up just by pulling them tight with one hand, as the cord locks are sewn down.The cord locks are located at the 11 and 1 o'clock positions at the front instead of at the sides for less interference with a pistol draw or side-worn holsters. 2 Large chest pockets - The high-rise location of the two chest pockets allows access to the pockets when wearing a pack waist belt. Inside each pocket is a plastic D-ring attached by non-elastic webbing for dummy-cording contents. The D-ring is attached to the rear of the pocket. There's a 5.5" deep slim flashlight/pen pocket near the zipper entrance. On the V5 Ranger Hoodie, this pocket was made out of fleece. On the Ranger Jacket, it's made out of the same mesh as the rest of the pocket liner. The mesh is not stretchy, so the pocket will only fit a fat pen or very slim flashlight. I cannot put a Leatherman Wave in it like I could on the Ranger Hoodie. Also standard is TAD's molded rubber media pass-through port, for iPOD, cell phone, or radio cables/wires. The chest pockets measure about 11" high x 6" wide. 2 upper arm pockets - These are located on the shoulders and extend up to the shoulder seam for more room. They're appoximately 9.5" x 6.5" in size and the zipper opening is 5". There's a D-ring sewn inside the top of the pocket, and the mesh lining has a Media port. Lower back double entry 'Hunter's pocket' - This is larger than on the V5 Ranger Hoodie, as the zippered openings have been moved outwards to the back panel seams. It now measures about 15" wide at the top and 14" wide at the bottom, and is 11" tall. It's located on the lower back of the jacket for storing soft items like beanies, gloves etc. It's easily accessible from both sides via the 8"-tall zippers. A secondary use for the pocket zippers is that they can be opened for small-of-the-back ventilation when the pocket is empty, as the mesh lining allows airflow. Thumb hole cuffs - the cuffs are of the same design as the previous versions; with the thumb holes for keeping the back of your hands warm and to prevent the sleeves from riding up. Gloves can be worn over or under the cuff. The cuffs are slightly tighter than on the V5 Range Hoodie, which I'm glad to see, as they used to ride down my hands a bit too far. Now, they stay put quite well and also seal around the hand better, keeping the cold air out. I'd still like to have a low profie die-cut rubber velcro wrist tab so I can tighten the cuff around my wrist to seal out the wind if I'm not using the thumbholes. Armpit vents - There are four buttonhole slit vents under the arms. Removable logo - The Ranger Jacket has TAD's standard glow-in-the-dark 3D PVC TAD logo patch which can be removed from the small velcro patch on the lower right of the jacket. Sizing/ observations - Back at the beginning of 2011, I tried a TAD Ranger Hoodie LT (Light), but returned it because of the fit. It was too tight under the armpits and the sleeves were too long; about 2" longer than my older Ranger Hoodies. So, with the Ranger Jacket, I was a bit worried about how it'd fit. Turns out the fit is just about perfect. TAD describes the fit of the 2012 Ranger Jacket as 'active, streamlined/athletic', and I think that it's an accurate description. Compared to my earlier versions of the TAD Ranger Hoodie (specifically the V5 from 2009), the Ranger Jacket fits slightly slimmer without being tight or form fitting. The arms are just the right length for me, and I'd estimate that they're about 0.5" smaller in diameter than the V5 Ranger Hoodie. There was a lot of room in the arms of the Hoodie, and just a bit less in the sleeves of the Jacket. I'd also estimate that the Jacket is about 1" smaller around the chest as well. This translates to a very nice fit with no excess bulk, and enough room underneath for a light insulating layer. The Ranger Jacket can be worn as an outer layer, but can also function as a mid-layer under one of TAD's hardshells. It's definitely not the body-hugging fit of the Arc'teryx Naga Hoody. For those who want a looser fit or want to conceal a pistol underneath, I'd go up a size. As is (I'm a size medium and am wearing a size medium here), mobility is great; and movements are unrestricted. The slimmer fit also helps it fit comfortably under a plate carrier as seen below, without bunching of material under the arms. On earlier versions of the Ranger Hoodie, the wrist cuffs weren't snug enough, which is why I wished they had adjustments at the cuffs. Since they were longer and wider to accomodate being worn over the hand, they were a little loose around my skinny wrists and small hands, so a draft could blow up my sleeves if was windy. With this Ranger Jacket, not only are the sleeves not as loose, but the wrist cuffs have also been tightened up. Now, they don't slip down over my hands and when I use the thumbhole feature, they seal around the hand way better than before. Much less drafty than before. I assume that the current versions of the Ranger Hoodie are constructed the same way, so this is nice to see. One thing I did was re-tie the zipper pulls. TAD has used thicker cord (similar to 550 cord) for zipper pulls on early jackets, then switched to sewn webbing pulls (see the photo below of the V5 Ranger Hoodie). On the Ranger Jacket, a 1/16" cord with a single knot is used. It's similar to the way Arc'teryx LEAF does they zipper pulls, except that Arc'teryx uses shrink wrap around the cord so the knot is always at the end. The current configuration of the pull on the Ranger Jacket doesn't provide a consistent grab - sometimes I ended up grabbing part of the loop, so the knot would then slide up to the top (look at the photo below on the left). Also, depending on how tightly they snug the knot at the factory, the single knot can loosen and the cord can come off (I've had this happen on similar jackets). In this case, I simply tied a second knot right at the metal pull which kept the loop from slipping and also added more security should one knot come loose. It's also easier to grab. Another common way of attaching the cord is to tie a cow hitch knot at the bar between the two holes in the metal zipper pull and use a single knot at the end. When shooting with the Ranger Hoodies, I usually have the hood down. While the hoods fit over my hearing protection, move with my head and don't really restrict my peripheral vision, I generally prefer to wear a fleece cap or regular cap instead, just for the added awareness. When not wearing hearing protection, a hood can also affect or confuse directional hearing since it can deaden certain sounds from the sides and is open only at the front. You only need to take a walk in the forest or around nature once, to see the difference a hood can make in your hearing. The Ranger Jacket therefore fits right into that role, where the user will want his insulation for his head separate from the jacket. Like the Hoodies, the Ranger Jacket has a pretty wide usable temperature range. It's breathable so it doesn't get too stuffy, even when it's a bit warm for a fleece jacket. I'd love to see TAD add pit zips, for even better ventilation than the pit slits. This would allow the user to vent more heat when on the move or during strenuous activity. If you don't need a compressible jacket, and want a fleece that's durable and very wind resistant, TAD's Ranger Jacket is very effective. If the weather doesn't call for a dedicated wet-weather jacket or soft shell, the Ranger series of jackets have become some of my favourite go-to choices as a stand-alone general use jacket in cold or chilly weather because of their comfort, performance and all-round utility. 3/14/15 - When the Atom LT (Light) Jacket from Arc'teryx's LEAF (Law Enforcement and Armed Forces) division came out in 2009, it quickly became one of my most-worn garments due to its versatility. Last year, LEAF updated their Atom series garments; adding some features as well as the Atom LT Hoody. The Atom LT Hoody is an exceptionally light weight, insulated hybrid mid layer that retains core warmth by blocking wind and trapping warm air next to the body. It can also function as a wind-resistant outer layer. The Atom LT Hoody is the hooded version of LEAF's updated Atom LT jacket. Both the Atom LT and Atom LT Hoody are mid layers that function as light outer wear. As mentioned in my original writeup on the Atom LT, it was designed to be modern, warmer and more water-resistant alternative to the old M65 field jacket button-in liner, to which some manufacturers added buttons in the front so it could be worn as a stand-alone garment. It's a trim-fitting insulating jacket that can be worn as a layer under a hard shell to provide warmth, or by itself as a wind and water-resistant jacket. It is very lightweight for the warmth it provides and is highly compressible. Since the original Atom LT came out five years ago, I've heard time and time again on the forums that folks have used it to replace of a lot of mid-layers, sweatshirts and light weight fleece sweaters. Last year, the Atom LT was updated with some new features and the Hoody was added. I'm really glad to see a hooded version come out, because there were times when I was wearing the Atom LT that I wished I had a hood (since I didn't have a fleece beanie with me). Material - The Atom LT Hoody has a composite construction; utilizing different materials for the shell on the main body and side panels. The matte outer shell of the original Atom LT was made of super light Luminara nylon weaveas well as the silky inside liner. The updated version of the Atom LT/Hoody are made of Gossamera, which has added durability over Luminara and is slightly heavier. It's still a super light and compressible ripstop nylon. Gossamera has an air permeability of 7CFM with a fluoropolymer-based DWR coating and a very light 'kiss-coat' of polyurethane for light moisture-resistance. The side panels are made of Polartec Power Stretch with Hardface Technology (88% polyester, 12% elastane, 230 g/m²), which is a body-hugging, breathable 4-way stretch fabric with two unique surfaces - a soft fleece inner layer for warmth and comfort; and a smooth outer layer that is abrasion and snag/pick resistant. The side panels allow air/wind to pass through, which keeps you from overheating when active. It's one of the features I like most about the Atom series. It's also the same fabric used on the Naga Hoody. The main body, hood and arms are insulated with 60g/m2 Polartec Coreloft which has a high warmth to weight ratio and rebounds quickly after compression. It is made up of two sizes of highly-crimped siliconized polyester fiber - the large fiber provides resilience and the small fiber provides air pockets for thermal efficiency. It has high loft in its normal state yet compresses down easily. Trim fit - The Atom LT Hoody is designed to be close-fitting, to minimize the amount of bulk when worn under an outer shell garment. It is of hip length with a drop back hem (longer in the rear). Insulated hood - The insulated hood has elastic around the opening and a single rear adjustment to ensure that it fits securely and does not obscure vision. The one-handed, single pull adjuster tightens the hood beneath the ears, so that it moves with the head from side to side. It can be rolled up and stowed loosely using the elastic hanger loop found inside near the label. When the hood is rolled up, it forms a warm, insulated collar to keep the wind out. The hood is meant to be worn under helmets; it is not large enough to fit over them. Full front zip - The full front zip has an insulated wind flap for added protection against the elements. The zipper has a cord and plastic pull at the end. Gusseted underarms and articulated elbows for mobility - The gusseted underarms are very comfortable and are made of the stretch Polartec Hardface fabric which allows air to pass through mroe easily. Two hand warmer pockets - You may not notice the entrance to the side hand warmer pocket as it's hidden, with the zipper opening tucked neatly into the seam. They're tall pockets and will fit rifle mags or a handgun. They're also lightly fleece lined for warmth. Media ports in hand warmer pockets - Media ports at the top of the hand warmer pockets allow routing of comms cables from pocket to the inside of the jacket. Polartec side panels - These are the aforementioned panels made out of Polartec Power Stretch with Hardface technology. Smooth on the outside, comfy fleece on the inside, and very breathable. The side panels are also treated with a DWR and water will bead up and run off. Vertical hem drawcords - These are accessed inside the jacket; you have to unzip the front to tighten them. It's a bit less convenient than bottom-accessed drawcords, but they're routed vertically so that they the ends don't hang out the bottom of the jacket and snag on gear. It's a sensible compromise. Sizing, fit etc - The Atom LT Hoody is a 'trim fit', which on me is just about perfect. I'm have sort of an 'average' build. The Atom jackets are designed to fit close to the body to minimize bulk when worn under other jackets/shells, and work very well in this role. I don't have big arms, and I can't wear much more than a thin long-sleeved base layer under the Atom LT Hoody. If a heavy base layer is to be worn under it, going up a size might be warranted. But for 'normal' use, buy your normal size. With garments that are designed more as outerwear vs mid layers, there can be a lot of excess material that bunches up or folds when worn under a jacket or shell. Even those that are designed as mid layers can be bulky under the arms, if they're made of the same material throughout. The Atom LT's thinner side panels made out of Powerstretch minimize bunching at the armpits (also due to their cut), and allow air to pass through for ventilation when worn as a mid layer under a shell with pit zips, while the rest of the jacket is very wind resistant for stand-alone use. The Atom LT Hoody is sized to fit under the Arc'teryx Alpha and Alpha LT shells as an insulative mid layer. Notes and observations - Note that the in 2014, Arc'teryx revised their Atom line, sometimes referred to as 'Gen 2'. The Atom LT Jacket that I featured six years ago would be the 'Gen 1'. The first thing I noticed when I picked up the Atom LT Hoody was that it felt more 'substantial' in comparison to the Gen 1 Atom LT Jacket. Part of that may be due to the insulation in my six-year old Gen 1 Atom LT losing some of its loft over the years (it's normal), but the main contributor is the use of the Gossamera fabric in the Hoody instead of the thinner Luminara in the Gen 1 jacket. The Gossamera is more durable and snag/abrasion resistant, but it also means that the Gen 2 Atom jackets don't compress down into as small a package as the Gen 1. Still, it's all relative, and the Gen 2 Atom LT Hoody is still a very packable jacket for the insulation it provides. Like the Gen 1, the Wolf Grey Gossamera outer shell is completely matte. These no shine or reflection from it. The LEAF jackets do not have any reflective logos or contrasting lettering like the commercial variants. When worn under a properly sized/designed shell (like the Arc'teryx Alpha or Alpha LT jackets), it's low profile enough that I don't feel too 'puffed up' like the Michelin man. I have full mobility without feeling any restrictions or stretching.Like the Atom LT Jacket, the Atom LT Hoody excels as a mid-layer/insulating layer under a shell, as that's what it was designed for. The low profile fit also makes it suitable for wearing under armour. For wearing over armour, there's always the Atom AF jacket which is sized and cut for wear over gear. When I first started using my Atom LT Jacket as a stand-alone jacket/light outer shell, I predicted that it would replace a lot of my sweatshirts and fleece garments out the cool weather go-to top hanging by the door. This proved to be true, as my Atom LT Jacket was probably my most-used jacket over the past 6 years. On cold mornings, I'd wear it and then stuff it into my bag when it got warm in the afternoon. Sweatshirts or light fleece garments don't provide any wind-resistance, and are usually loose-fitting and unsuitable for wearing under a shell, so the Atom LT Jacket took over that role. It was also warmer (without being stuffy) and wind/water resistant - something sweatshirts or most fleece garments weren't. The only thing I felt was missing sometimes, was a hood. When wearing a shell, which provides little insulation, I'd have to wear a fleece beanie. However, when used as a stand-alone jacket, the neck can get cold even if the head is covered with a beanie. The Atom LT Hoody now addresses that issue, for those (like me) who like to have an attached hood for insulation and light moisture protection. The Atom LT Hoody has light water resistance; water beads up and runs off the shell and side panels (it's still new, of course, so that's to be expected with the DWR still fresh. You can renew the DWR as with other garments). Heavier rain or prolonged exposure to moisture will cause the water to soak through; this is not intended to be a water-proof shell. It's a helluva lot more effective than a sweatshirt or fleece sweater though. Comfort is exceptional, as the inner fabric has a silky smooth finish and the fleece panels are very soft. The hood has one adjustment, and this tightens the hood around ear level, so that the hood opening moves with your face, rather than your face moving inside the hood. This ensures that you don't lose peripheral vision. The hood provides more protection than a fleece cap, and seals nicely around the face, keeping wind from blowing down the collar. When the hood is rolled up, it's secured loosely by the elastic hang loop inside the collar and a rubber bar. The rolled up hood forms a comfy, puffy collar to keep your neck warm and form a good seal against the wind. The only complaint I have is with the main zipper. It slides down too easily, and can sometimes cause the collar to open up slightly if you've gone through a lot of movement. While the non-locking zipper was intentional to allow for easier venting, I'd still prefer a self-locking zipper that moves only when you tug on the zipper pull, and locks in place at any position on the zipper. I'd give up the quicker venting to correct the non-intentional venting. The newly added hem adjustment feature is a nice addition as it now enables the user to snug the bottom hem of the jacket around the hips, sealing it from drafts. While the ends of the vertically-placed drawcords are inside the jacket, it's still possible to turn the bottom inside out and tug on the drawcords without undoing the main zipper. The Atom LT Hoody is very compressible for a 'puffy' jacket and more so than a fleece garment of equivalent warmth. The Atom LT Hoody is a bit more bulky than the Gen 1 Atom LT Jacket due to the addition of the hood, hem adjustments and thicker outer shell material (this is why the Gen 2 Jacket weighs 4 more ounces than the Gen 1 Jacket). I was able to stuff the Gen 1 Atom LT Jacket into its inside breast pocket although Arc'teryx does not recommend this (puts stress on the zipper). The Atom LT Hoody will not fit into its inside pocket, but Arc'teryx has a neat video that shows you how to stuff your Atom jacket into its sleeve. It makes for a smaller, compressed package, as shown below. I've been wearing the Atom LT Hoody this past winter, and it has performed admirably in light precipitation (drizzle) and mild to chilly conditions. Note that since the side panels are made of the breathable Polartec Hardface fleece, wind will pass through it. If you want a more wind-resistant garment similar to the Atom, than consider the civilian Atom AR (or the LEAF Atom SV for a cold weather outer garment). But the breathable side panels are essential when wearing a hard shell over the Hoody and you want to utilize the pit zips of the shell for ventilation during aerobic activities. They also provide the stretch needed for unrestricted motion like when shooting a handgun or when wearing gear. The Atom Jacket and Hoody aren't just for cold weather; evenings can get chilly even in the summer months, so one of these jackets will always be in the car for convenient access. Like the Atom LT Jacket, the Atom LT Hoody is an awesome, all-round garment that will end up being one of your favourites.